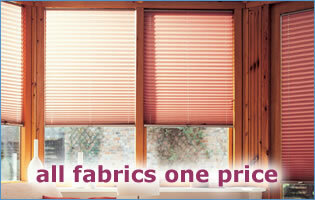 Before you make your final choice of blinds for you conservatory please obtain a no obligation quote from us. Not only can it be extremely beneficial to you financially but because we operate a 'one price policy' the advice you will receive is based upon your real requirements and not on any underlying 'sell up' approach that you will no doubt come across during your search. 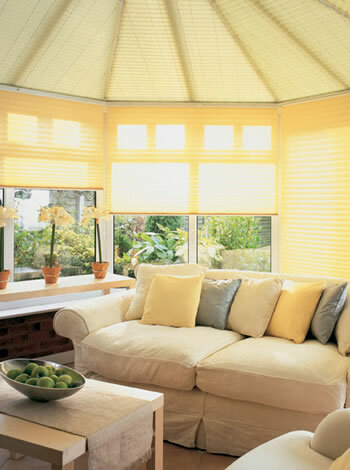 Because pleated blinds are the answer to conservatory roof requirements the term 'conservatory blind' is generally used in reference to pleated blinds, however all blind types are equally applicable in conservatory situations and the wealth of purpose fabrics that we have available ensures that every individual requirement is catered for all within our unique 'one low price policy'. 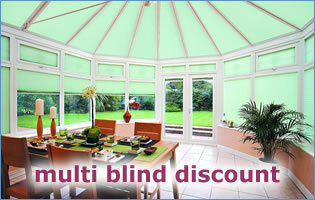 For Customers who are in the early stages of deciding a conservatory supplier we would urge that you obtain quotes with and without blinds where they are offered as a 'package' by the conservatory builder as the premium that you pay can be extremely inflated, by up to 500% and much more with interest if they also provide finance. We have been sub contractors to many well know conservatory companies over the years and know that you can save a lot of money by arranging for blinds to be measured and fitted independently and not as part of an 'all in' package. Bearing in mind that the process of measuring and fitting has to be undertaken after the conservatory has been built anyway as only then can sizes be determined with a made to measure product, so you will not save on time or inconvenience either. Secondly, not only is blind choice important for factors such as sun glare, privacy and heat gain but also a big decider that is overlooked more often than not, is conservatory usage. Take the window sill as an example, if you want to display photos, ornaments, flowers or plants then it would be prudent not to choose vertical blinds as they would need to occupy the same space. Or if your conservatory has become a child's play room then you will want something that can either be drawn out of the way or has dynamic light control both with added child safety precautions. On top of the many considerations that need to be included the choice of fabric plays a major part in the ultimate comfort, security and general feel of your conservatory. After all a conservatory is essentially a greenhouse that is attached to your house and every year during the summer months we come across situations where Customers have to literally create a 'no go' area as the heat gain and glare is too much to bear. Calling for speciality fabric we offer the full range of solutions that are currently available including blackout, foil backed and glare reducing fabrics in a variety of colours and qualities but all at one low price ensuring that you can make a choice based on what you require and not as a compromise due to budget restrictions. Every conservatory that we come across has needs that are specific to the individual Customer and so it is important that you take advantage of our many years of experience and knowledge which are offered free of charge and without any obligation to purchase.